The civic body, one of the richest in the country, has been running on a surplus budget for five years. With the AAP government and BJP-led municipal corporations locking horns over funds – and basic facilities taking a hit due to striking corporation workers – a small part of the capital, comprising Lutyens Delhi and surrounding areas, remained unaffected. With around 44 square kilometres under its jurisdiction, this central Delhi zone falls under the jurisdiction of the New Delhi Municipal Council (NDMC). Since the MCD was trifurcated, the financial issues of the three corporations have continued to escalate, resulting in constant strikes by its employees over non-payment of their salaries. The council, on the other hand, is believed to be one of the richest civic agencies in the country, operating under a surplus budget for at least five years. “The council generates around 95 per cent of its revenue on its own. This money comes through licence fees, user charges, tax revenue and interest earned on its investments,” said NDMC Chairperson Naresh Kumar in this year’s council budget address. 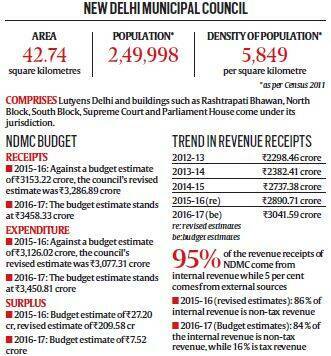 In the financial year 2016-17, NDMC expects to earn Rs 3,458.33 crore and will be spending Rs 3,450.81 crore. According to the NDMC, the main reason for its profitable status is the extent of recovery from properties in its jurisdiction and from its investments. “Licence fees is a major source of revenue. The council also gets interest from investments in banks. So, the council never really faces a problem as far as revenue is concerned,” the official further said. Another source of revenue for the council is the property tax it collects from the area. “Last year, we had collected Rs 107 crore. This year, Rs 300 crore has been collected and this figure will increase since the financial year is not over yet. This was possible because of the way we managed the tax collection process – through SMS alerts, opening FM radio channel counters in various parts of the area. Several property owners who do not live in Delhi were also informed about payment of tax,” the NDMC official said.